Cats, hearts, and love all go together. 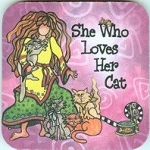 Catty Corner knows you'll find the best gift to match for cat lovers gifts for Valentine's Day. There are cat pins, pendants, bracelets, and earrings that tell the world you are a cat lover. Get plushes, mugs, figurines, and more.